Huffington Post colum nist Paul Abrams demonstrated this line of thinking in a March 9, 2011, piece. These words create something of a dilemma. Either the founders didn’t really intend to create a general government of limited powers, or the general welfare clause doesn’t really mean unlimited federal authority to fund things beneficial to the nation as a whole. The fact that the framers followed up the general welfare clause in Article I Sec. 8 with specific enumerated powers indicates the latter – a qualification [limitation] on federal authority. If they had intended Congress should have the power to do virtually anything and everything to promote the general welfare, they wouldn’t have bothered to include specific powers. James Madison made this very point in a letter to James Robertson dated April, 20, 1831. During the ratification debates, anti-federalists who opposed the Constitution voiced fears that people like our columnist Abrams would come along and assert the term “general welfare” granted unlimited power to the federal government. Supporters of the Constitution swore it would not. Even Alexander Hamilton, the framer most in favor of expansive federal power, conceded as much in Federalist 83. Madison specifically addressed the anti-federalist fears in Federalist 41. Randolph addressed this same argument at another point during the debates. In other words, the general welfare clause in Article 1 Sec. 8 empowers Congress to tax, but it doesn’t empower Congress to spend. The specific enumerated powers that follow limit the federal government’s spending power to specific objects. Madison further illuminated the intent of the general welfare clause in a letter to Edmund Pendleton dated Jan. 21, 1792, pointing out that the phrase was lifted from the Articles of Confederation and was intended to retain its meaning in the new Constitution. 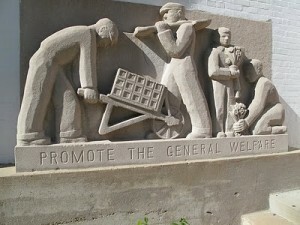 Clearly, the words general welfare must mean something other than a grant of power for Congress to do whatever it pleased. What exactly did the framers mean? Two words in the clause hold the key. General and common. The phrase simply means that any tax collected must be collected to the benefit of the United States as a whole, not for partial or sectional (i.e. special) interests. The federal government may promote the general welfare, or common good, but it must do so within the scope of the powers delegated and without favoritism. ← Constitution 101: Who Decides Constitutionality? Any discussion of the meaning of the general welfare clause which limits itself to cherry-picking snippets of letters which give the opinion of the writer (“I have always regarded”) and then seeks to arbitrarily interpret the clause to be a refutation of the govt “doing whatever it pleases” (strawman) is misleading and myopic. What if it pleased the govt to defund education, food stamps, social security (which is self funded and fully healthy) or subsidies for hospitals so they can treat the poor? You have to look at what scotus ruled in the 30’s, because THAT is what the constitution means. Further debate is essentially moot. Any discussion of the meaning of the general welfare clause which limits itself to the opinions of politically connected lawyers some 140 years after ratification, and that seeks to arbitrarily interpret the clause to justify all of the things the writer wants government to do, is misleading and myopic. If you would like to bring to the table some founding era evidence to back up your broad interpretation of “general welfare clause,” I would LOVE to see it. Otherwise, you are right – further debate is essentially moot.